Although I know how colors can affect us (which you will read more about later), I had my doubts about how color affects feng shui. So I consulted a feng shui master. After a brief conversation, he reminded me that we perceive Qi through our five senses. Then I remembered that I wrote something consistent to that, where I talked about understanding Qi through our five senses. I failed to make the connection between color and energy at that time, but I will do so in this blog post. Here, you will first learn about how color influences us through research in psychology and marketing. Then, you will find out how color is used and how it affects the feng shui of the house. In case you didn’t know, my profession is digital marketing, and colors play a big part in what I do. 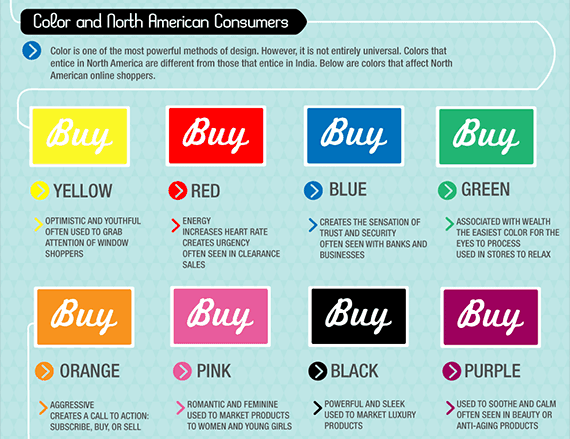 In marketing (not just digital), colors are used to influence how people buy. In feng shui, colors are used to improve the comfort level and well-being of the home’s occupants. Though feng shui and marketing uses color to achieve different ends, how colors influence us are fundamentally the same. To begin, let me illustrate by using some examples from marketing. Here’s the story about how I got started with colors. About six years ago, I was researching on how to make more people click on my advertisements. In a world filled with so many advertisements, I was trying to grab people’s attention. As I was plowing through marketing studies and research, I encountered a new concept called A/B Testing. In short, it is a new web technology that allows marketers to compare two versions of the same webpage to see which one performs better. The famous A/B test I read about was the green vs. red button test. The two webpages are completely identical besides the color of the button. Can you guess which button people clicked on more? It turned out that 21% more people clicked on the red button. Are you surprised? One reason was because the color red grabbed our attention more than the green one, which led more people to click that button. This is just one example on how color influences us. After learning about the red versus green button test, I dug deeper. I learned that colors are not just used in design to grab people’s attention, it’s also used to attract a specific type of shoppers and influence shopping behavior. 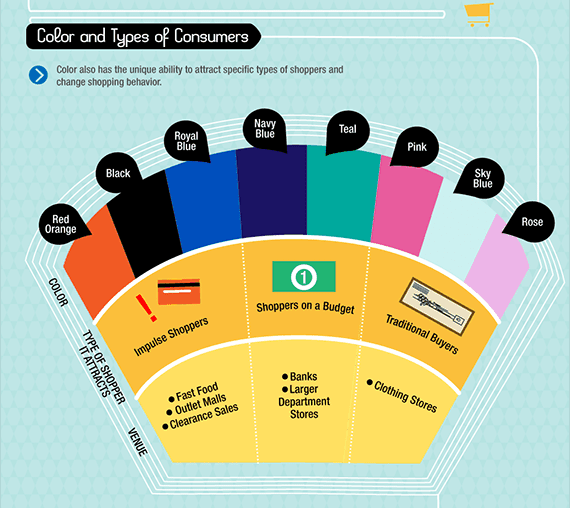 Below is a section of the infographic by KISSmetrics that shows how colors are related to different types of shoppers. Studies have found that 85% of shoppers place color as a primary reason for why they buy a particular product. This shouldn’t come to you as a surprise because we depend more on our sense of vision than our other senses. Colors are not just used for webpage and product design. While studying the effects of color and marketing, I read about why Facebook is blue. It led me to find out that color has the ability to trigger our emotions. Commercial brands understand this, and that is why brand logos use certain colors. They want to influence how we feel towards their brand. Most colors can be categorized as warm, cool, and neutral and has the ability to make us feel happy or sad. This is how we perceive color’s Qi through our five senses, namely, our sense of vision. This is where feng shui comes in. Colors are used as a feng shui cure and is applicable in a wide variety of situations. Some common places or objects where color is applied include the front door, bed sheets, furniture, walls, and the list goes on. Marketing uses color to influence our purchase decisions by grabbing attention, influencing behavior, and triggering emotions. Unlike marketing, feng shui uses color with the ultimate goal of bettering your health, career, relationships, and many aspects of your life. In the context of feng shui for the home, I don’t think there’s much need to use colors to grab attention. However, colors can be used to influence behavior, such as improving bedroom romance and to trigger or neutralize emotions, such as making a space feel more comfortable and relaxing. Here’s how colors are used in the context of feng shui. Color can be used as a feng shui cure to balance the Yin and Yang energies of the home. Brighter colors usually bring more Yang energy, and the reverse is true. For instance, the living room is suitable for more Yang energy because it is a place of high human activity. It is where people congregate, chat, and laugh. Therefore, brighter colors are more favored in the living room, because it wakes us up and gives us more energy. Conversely, the bedroom is suitable for more Yin energy because it is a place of rest and sleep. Too much light can disrupt our sleep cycle and quality, that is why dimmer colors or lighting are more favored in the bedroom. The colors of this bedroom is too vibrant and energetic for proper sleep and rest. Our eyes detect colors only in the presence of light. The greater the amount of light, the more the amount of Yang energy we absorb through our vision. Further, brighter colors reflect light, which makes bright colors even brighter and amplifies the amount of light and energy through reflection. To balance the amount of energy, dimmer colors such as dark blue or black can be used as a feng shui cure to absorb some of those light. Colors are closely associated to feng shui’s five elements and can be used to strengthen the feng shui element associated with a specific area of your home. There are many more colors that are not included here. To know which color belongs to what element, try to mentally connect that color with an object created by nature. The attributes of that natural object will give you clues on what element that color belongs to. If you can’t identify the element, don’t get too hung up by it because you can always choose other colors. Each area in the house belongs to a different element. The image below gives you an idea of the elements associated with each area of the house. Colors can be used to strengthen or balance the element represented by each direction, and here’s an overly simplified example. Wood is associated with East. To strengthen wood, you can introduce colors associated with wood. 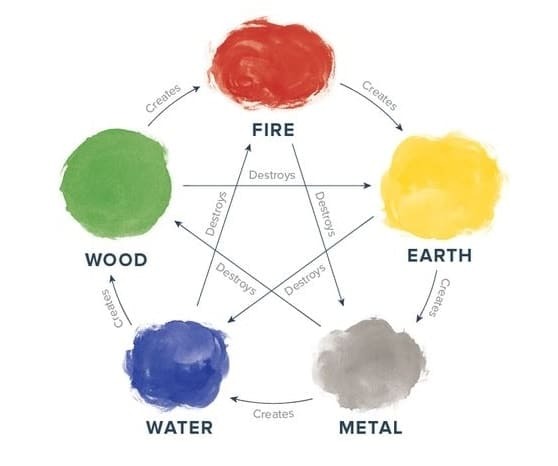 Or, if there’s a fireplace in located at the Eastern part of your home, you can introduce colors associated with water, because the water element nurtures the growth of wood and destroys fire at the same time. Using the same example, imagine if the fireplace is surrounded by a red sofa, red carpets, or both. This means that the fire element is too strong and misbalanced, which will make most of us feel irritated and unable to relax. Though colors have influence on us and on feng shui, their effects can only go so far. Some people expect that by painting the front door red, good luck is bound to come. I’m here to tell you NOT to have this kind of expectations. Color, just by itself, will not make or break the feng shui of a house. In other words, its effects are limited. First of all, color doesn’t change the fundamentals of a home’s feng shui. It doesn’t change the direction of the house, its positions, and how Qi flows inside. So if the house, at its core, is deemed to have bad feng shui, adding colors here and there will not help. Even if it does, the effects are minimal at best. Secondly, although colors can be used as a cure that supplements the five elements, colors cannot activate the element associated with that color. If you wish to activate a specific element, actual objects pertaining to that element should be used, such as placing an aquarium or a water feature for an area that needs the water element. Although its effects are limited, color still has its place in feng shui. As previously mentioned, it can be used as a feng shui cure, such as balancing the Yin and Yang and to supplement the five elements of a specific area in the home. Choosing the right feng shui color depends on many factors and can be quite tricky. The application of feng shui is fluid and has many different approaches. Nothing is definite unless the situations warrants it. For example, a red door could be suitable for his house but not yours. 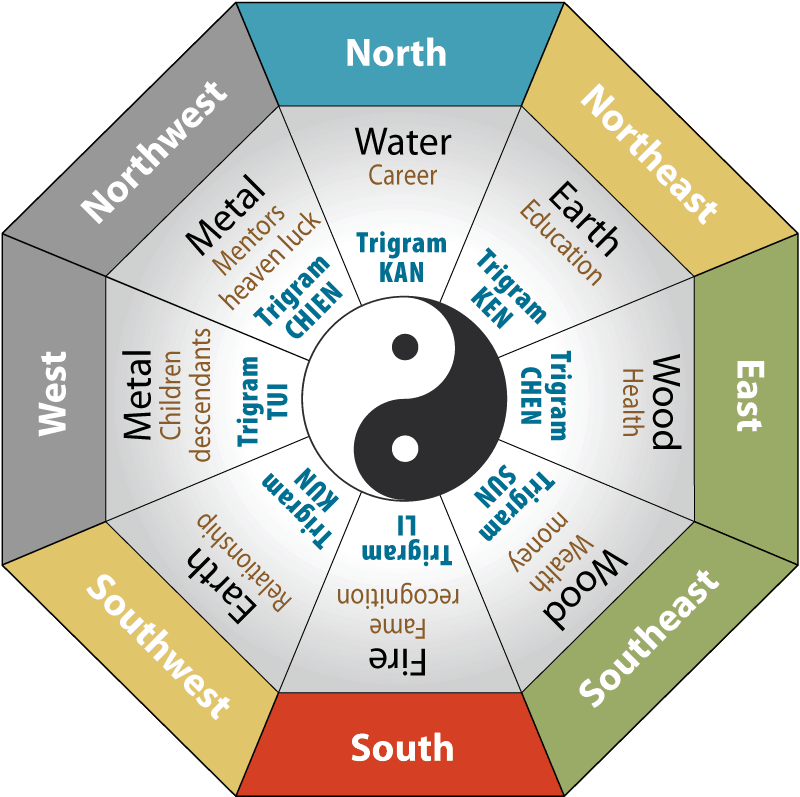 The key is to find the right balance among the many factors that influence feng shui, of which a feng shui consultant is trained to identify. If you choose to do feng shui yourself (though I don’t recommend), here are two factors you should consider when choosing colors. Colors can be applied to almost anything you see. In the living room, the object can be the sofa, the coffee table, and the carpet, among many others. In the bedroom, it can be the bedsheets, the color of the wall, and the bedframe. The colors you choose to apply depends on what’s around those objects. Let’s use the house’s exterior color as an example. If you’re thinking of paining the exterior of your house, you need to consider the natural environment that surrounds the house. For example, a house that’s surrounded by green trees and pasture should have a different color than those that’s situated in the middle of a brown, dry desert. What you want is to have the color of the house to work harmoniously with its surroundings. But what does that mean? It means that you do not want the color to blend (unless you’re trying to hide) or contrast with what’s around (unless you want your home to be the center of attention). This house with red exterior may have a unique purpose. It can be easily identified in this wilderness. It sticks out and helps the owner to get home easily or stranded hikers to easily ask for help if needed. I’ll use web page design and advertisements as an illustration of “harmonious” colors because I’m sure that you have seen many of those in your lifetime. As for web page designs, I’m sure you’ve seen those where the colors just seemed “out of it”. Their misuse of color made you feel irritated and want to leave the instant you landed on their site. A sample webpage where the use of color is distracting and “out of it”. Some other websites like to use white text with black background, which is also not the best color choice. In case you haven’t noticed, most websites have white text on black backgrounds, and that’s because it’s easier to read. Which one is easier to read? The white text on black or black text on white? If there’s not much text to read, or if the text is big, then you wouldn’t have too much trouble reading. However, if there’s a long passage, you’d find yourself reading slower while putting stress on your eyes. You won’t even bother to find the information you were looking for, even if it might be somewhere in that site. As for advertisements, you’ve probably seen many photos and designs with different color combinations that evoked different types of feelings. Ice cold drinks will show light blue combined with white that reminds you of the arctic or the snowy mountain tops. Organic food usually bundles earthly green and brown to remind you of nature and natural products. 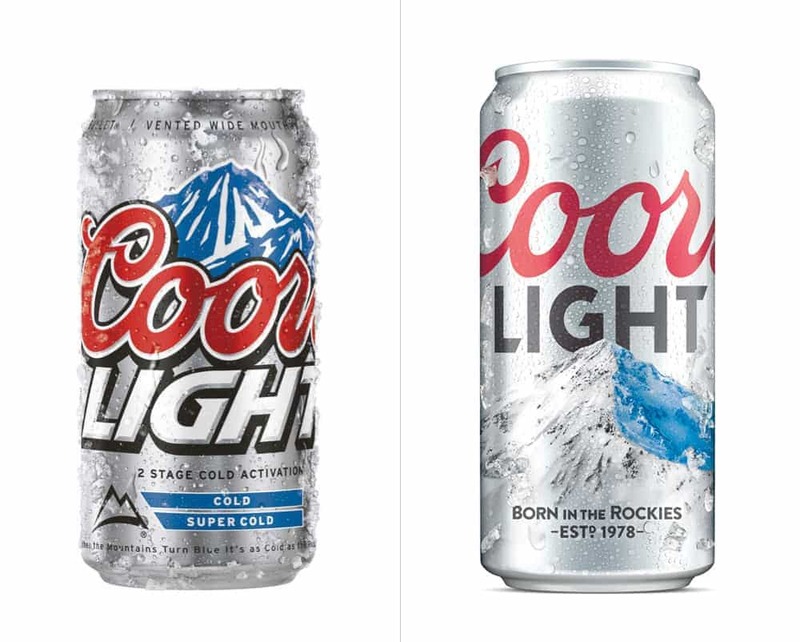 Coors Light beer uses blue and white to convey ice-cold beer brewed from mountain springs. Let’s go back to the example of the house exterior color. 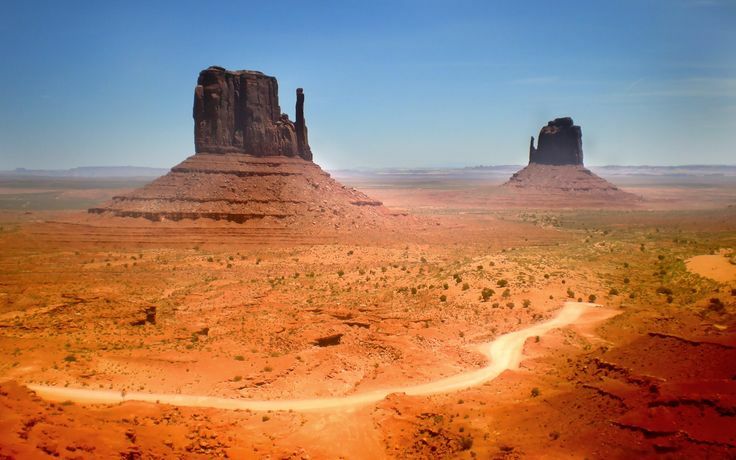 If you’re living in a scorching-hot reddish brown desert, you probably don’t want a red house because the sight of it is likely will remind you of heat and make you feel warmer. Simply looking at this picture makes me feel warm. 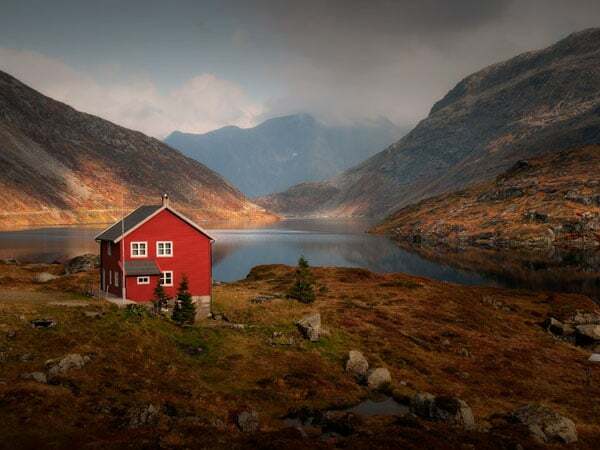 In terms of feng shui, red symbolizes the fire element, and one feng shui effect of too much fire (red house with nature’s heat) is elevated temper. This coincides with scientific findings showing a link in human aggression and higher temperatures. So when picking a color for yourself, I suggest that you use it to balance the kind of feeling that YOU are looking for. This brings me to the second factor when choosing color. If you’re wondering why I haven’t given you any concrete tips on what colors to use, here’s your answer: It’s because of YOU. 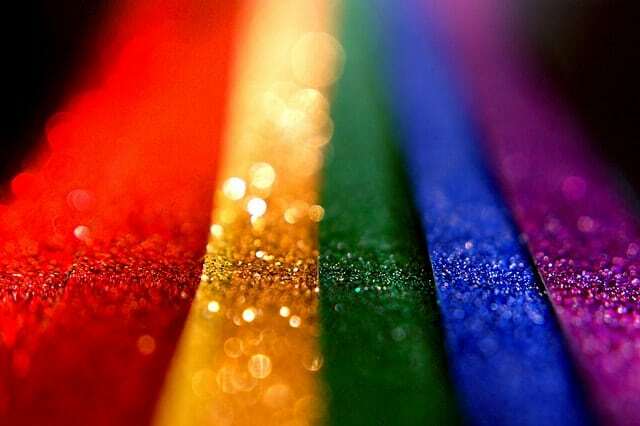 Although there are similarities among how people respond to colors, every individual has a unique preference and feelings toward different kinds of color. 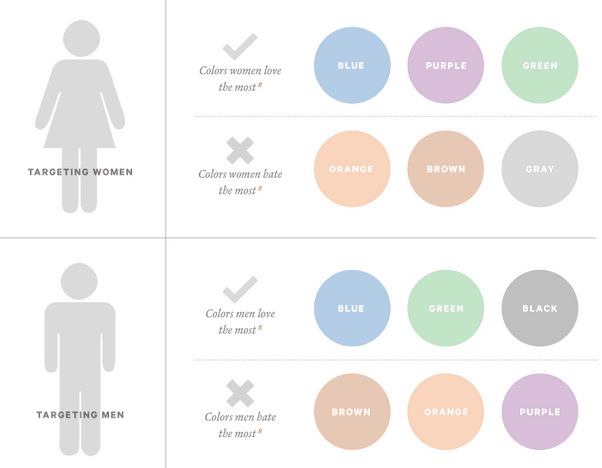 Color preferences and feelings are usually determined by a person’s past experience with that color, but other factors such as culture and gender also affects what a person prefers. For instance, though males and females in North America has blue as their favorite color, they have different colors as their second and third preferences as well as the colors that they dislike. When choosing colors, I feel it’s always better to choose a color that you prefer. The color that’s most soothing and appealing to you will serve you better than a disliked color that helps supplement your feng shui requirements. Colors have the ability to grab attention, influence behavior, and trigger emotions. And because we perceive Qi through our five senses, colors can help balance the Yin and Yang energies and to supplement the five elements associated with the different areas of a home. This is how our eyes and brains are wired to process color. When choosing a color for feng shui purposes, it is best to consult a feng shui expert. But if you do decide to do it yourself, you need to consider the environment that the object is surrounded by. At the same time, remember to use a color that you personally prefer, otherwise it may bring more harm than good to you on a personal level. Have you tried to feng shui your home with colors? How did it work for you? Please share your thoughts using the comment below! I really love the information, but lately I being feeling very depress what products can I have to bring good and positive energy and happiness and think positive. I would suggest that you get in touch with nature, so getting some of your favorite plants would help (fish tanks would help, but don’t get it unless you’re ready for that commitment). What I personally found helpful was to go for a walk. Spend a day at a park, go hiking, or walk along the beach. Hope you feel better! Your welcome Sonia! Here are some ways you can get involved in nature – walk barefoot on grass or on beach sand, a walk in the park, or just spend an afternoon in someplace surrounded by greenery. Finding that time could be tough for you, but always try to squeeze in some time for yourself! Good luck and best wishes! Good morning and yes I definitely going to try it thank you….